TGISVP – Beta Portfolio: Assume an investor goes equally long all 27 stocks with positive Upside Potential (e.g. invests EUR 1 in each stock, for a total of EUR 27). The other 54 stocks, identified as neutral (2) or over-valued (52), are ignored. 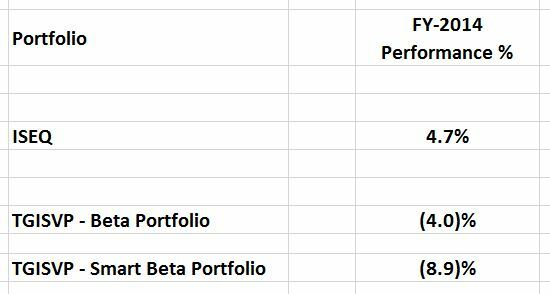 The portfolio return contribution from each stock is simply its Gain/(Loss)%/27. [NB: Again, see my last post – the appropriate benchmark return here is 4.7%, reflecting the ISEQ’s performance from March-30th ’til year-end. For reference, calendar year ISEQ performance was 15.1%]. – Kennady Diamonds (KDI:CN): Dermot Desmond has long been involved here – he currently owns a 17.5% stake & the Chairman Jonathan Comerford’s actually an investment manager with IIU. However, the company has no other Irish connections, and I’ve never noticed any kind of Irish PI/institutional following for the stock. – Kennedy Wilson Europe Real Estate (KWE:LN): KWE’s a new fund launched by Kennedy-Wilson Holdings (KW:US), focused on investing primarily in real estate & real estate loans in the UK, Ireland & Spain. While the fund’s already completed a chunky Irish acquisition, one would expect Irish assets will ultimately be the smallest component of the portfolio (considering the relative size of the UK/Spanish economies & property markets).